Operation Squad Evolution is the new edition of well know Operation Squad. Operation Squad was written to help simulate heroic events, but after four years of success with that game we wanted to publish a new version which includes all the experience gained in the meantime, and also during the development of our other successful games like Assault Platoon (platoon level gaming), Wild West Chronicles (Far West) and Centuria (Ancient Battle). Thanks to some easy and intuitive rules you can now simulate heroic encounters set in the Second World War. 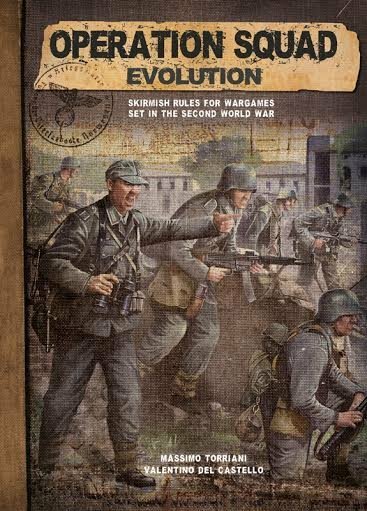 We have included lists for American, British, Russian and German armies; there are a total of twelve to choose from, including Red Devils, Fallschirmjägers, Rangers and Commandos but more you can download for free on this site.Each weapon has been given a points value that means you can play balanced yet historically accurate scenarios. The use of charts has been reduced to a minimum and the whole game system is based on adding or subtracting the rolls of six-sided dice. These rules contain three standard scenarios covering typical missions such as reconnaissance, taking a town and rescuing a spy. So what are you waiting for? It’s time to show your bravery on the battlefield! 94 pages + sheet counters.